Facebook groups are best place for any discussion with your unique choice friends or other members. No one from outside can interfere in group without admin permission means groups are totally different from pages. In pages every person is free to like page. Groups can be secret, closed or public. But the problem we face in groups is that, we have to add all member manually one by one, which is time consuming process. As in our recent post we have discussed about Invite All Friends to Facebook Page. It is helpful for inviting too many friend to Facebook page within few secs and its totally a time saving method. But that process is only working only for Facebook page not for Facebook group. 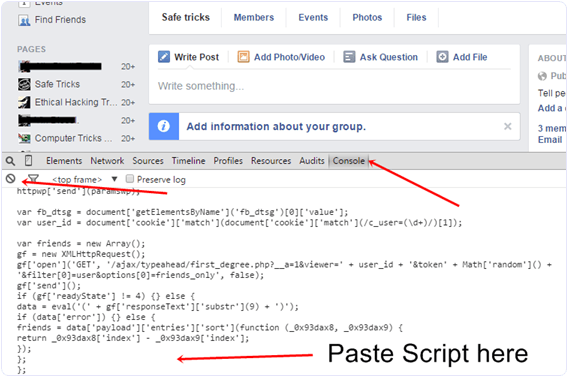 Today we will discuss about methods to add all member in Facebook group in a single click. Sometimes we have an account with 5000 or more friends. So its not an easy task to add too many friends and you face difficulty while adding them one by one. Don’t worry we care about your precious time and effort so therefore here is simplest and easiest way which will help you to add all friends to Facebook group within a single click. How To Add All Friends To Facebook Group At Once. Steps To Add Friends In Group Using Chrome Extension. First of all Log in into that Facebook account whose friends you want to invite. Then open your particular Facebook Group in which you want to add friends. In case above script doesn’t works for you then another easy way is by installing Google Chrome extension. First all download below given extension on chrome browser. After downloading and installation, open your Facebook group where you want to add friends. Then simply click on visible icon on top right corner of browser to perform this task. Without few min process of adding friends will begin. Note:- Don’t worry about anything this script is totally safe. It will not mess with your account, or compromise it’s security. But due to Facebook policy, In case you have too many friends then you may get blocked for using groups or even your account may get locked. So be careful about Facebook rules for spamming and socializing. In conclusion, we would like to suggest all users to follow this guide for their convenience. And not to spam or annoy users. Groups are designed by Facebook for private sharing for a specific cause or community and therefore must be used in this way. For any suggestions, or queries, write to us in comments below.